The prevention of waste generation and its reuse has become one of the priorities in the hierarchy of principles promulgated by the European Union in order to build a “recycling society” and thus contribute to the fight against climate change. The objectives set by the European Union are, among others, to reach household waste recovery rates of 50% by 2020 and to recycle 65% of urban waste by 2035. 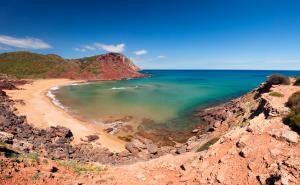 With this principle, and within its commitment to sustainable development, the Consorci de Residus i Energia de Menorca works on several lines of action for the reduction of waste, ranging from the reform project of the Milà Plant and the optimization of waste treatment, to the management of its selective collection and the implementation of public awareness campaigns. Within this framework, and for the second consecutive year, the Consorci launches the campaign “Fer compost és la pera. 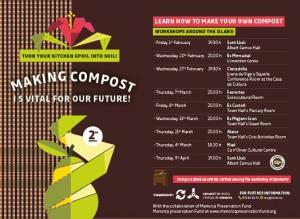 De la cuina al camp” (Making compost is vital for our future. From the kitchen to the soil), an initiative that aims to promote home composting from organic waste generated at home and that this year has the support of the Menorca Preservation Fund. 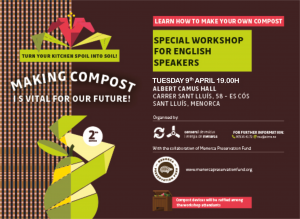 Within that campaign, the MEPF invites you to a free workshop next 9th April (19.00h Albert Camus Hall, Sant Lluis) which attendees can acquire the basic knowledge to turn the remains of food and plants into compost, a high quality fertilizer. As we want to get involved also those residents that live only a few months every year on the Island but really want to commit to making compost as to reduce the amount of rubbish they generate, English speaker are most welcomed to this last workshop of the campaign. The campaign also seeks to continue stressing the importance of separating food waste and vegetable waste such as leaves, grass or branches well, and the advantages of recycling them. Those attending the workshops will also be able to acquire by lot a composting machine in which to start transforming organic waste. According to the Consorci, the waste that a home generates on a daily basis contains 40% organic matter that can be recycled and returned to the soil in the form of humus for plants and crops. Through a simple composting device that can be installed in the backyard, this organic matter can be composted naturally, and transformed into fertilizer for the plants, orchard or garden. This contributes to the reduction of waste and reduces the consumption of chemical fertilisers. It has been calculated that with a composting device each inhabitant would stop throwing 90 kilograms of rubbish into the container, which means significant economic savings in waste management. Disposing substance or object by throwing it into a garbage not necessarily mean that it disappears. After being considered waste, a complicated and costly process of waste management begins until its final destination, recycling or its treatment in waste plants for later storage. This is why, according to the Consorci, it is so important to make citizens, institutions and companies aware of the importance of proper waste management that involves society as a whole. This involves considering waste as a resource that can redound to the common benefit, be it environmental, economic or social. What are these benefits? Compost production clearly contributes to the recovery and preservation of the environment. Reducing the amount of waste that ends up in landfill reduces emissions of untreated organic matter such as methane, which has a high greenhouse effect. In addition, returning organic matter as compost to the soil means its enrichment and preservation, combating possible processes of soil impoverishment such as desertification or reducing the generation of polluting chemical fertilizers. Regarding possible economic and social benefits, in addition to the economic savings that greater efficiency in waste management can mean for the administrations, recycling and the availability of new raw materials in safe conditions can open new business opportunities and job creation. Advancing towards the recycling society is thus a further step towards sustainability in order to make human activity compatible with the preservation of our environment. For all these reasons, the MEPF, the Consorci de Residus y Energía, that includes all the island’s town councils and the Consell Insular de Menorca, invites you to attend the auto composting workshops since, as they explain, the best waste is the one that is not produced.